When wandering around the village, the donkey on one night met a jackal who lived in the near by jungle. The donkey and the jackal became very good friends. They both thought about a plan to enter into the farms in the village. The donkey would break the fences and then they both get into the fields. The jackal would eat the poultry from the farm when the donkey ate the cucumbers in the fields. This continued for several days. One particular night, while eating the cucumbers the donkey saw the full moon and the cloudless sky. The Donkey got very excited and began to sing. The Jackal immediately stopped him and said, "Dear friend, what are doing? We have come here to steal. It is not a wise thing to make noise like this at this time"
The donkey got angry when the jackal called his singing as noise. He said, "hey jackal, you are very jealous about my voice. That is why, you are stopping me from singing. You should learn to appreciate my singing". Saying this, the donkey started braying more louder this time. 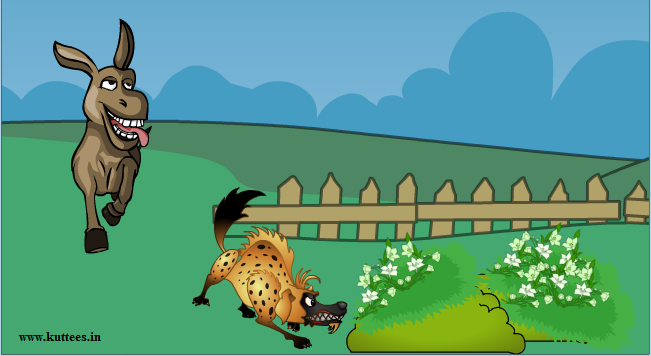 Realizing about the danger that would come, the jackal immediately jumped out from the farm and hid himself behind a bush. Hearing the loud braying of the donkey, the farmers ran to the spot with sticks in their hands. They beat the donkey so hard and tied him to a wooden mortar. Moral: One should think well before doing anything.